Immigration is a key component of net population growth in Canada. The below-replacement fertility rate (1.7 children per woman in 2007)1suggests that immigration will become the primary source of population growth2. The 2006 Census estimated that 1,110,000 people immigrated to Canada between January 1, 2001, and May 16, 20063. 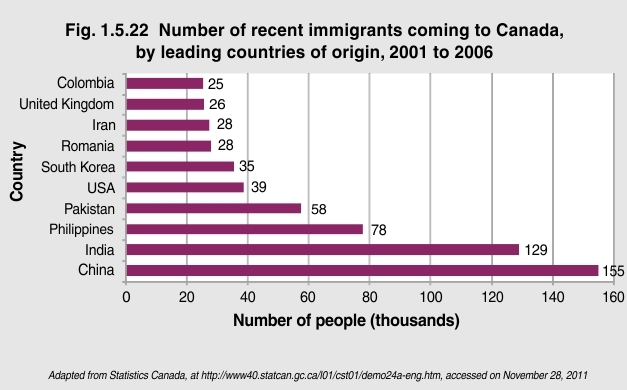 Immigrants from the 10 leading countries of origin accounted for 54% of all recent immigrants to Canada. Most came from China and various other regions of Asia, including the Middle East. Many others immigrated from the United States, Romania, the United Kingdom and Colombia. 1OECD Factbook 2010, (doi: 10.1787/20752288-2010-table-can). 2Citizenship and Immigration Canada. Pursuing Canada’s Commitment to Immigration: The Immigration Plan for 2002. Starting life anew in a foreign country is not without obstacles. Many new immigrants to Canada must secure employment, enrol in school, find housing, learn a new language and the customs, register for health care, make friends and familiarize themselves with the expectations of their new neighbourhood. Social services, including church groups, job assistant programs and life skills training, can help to smooth the transition.